88% of prospective car buyers use the internet to research an automotive purchase before even setting foot in a dealership, and with the wealth of automotive information out there, they can find everything they need to know for their purchase, from the model that fits their needs to the price and (where applicable) rebates and incentives available. 60% of these shoppers spend six or more months doing their research, with dozens of touch points along the way where they gather information as they move along their journey to a decision. By the time a car buyer walks into your dealership, they usually know what they want and how much they’re willing to pay. At that point, you can capture the sale, but you’re not going to have as many chances to add value or build a rapport. However, if you go the extra mile and engage your customers at every step along their digital car-buying journey, you can help ensure they choose your dealership and build the lasting relationship that leads to more profitable sales now, and more sales down the road. 1 - Awareness Stage: The buyer realizes they have a want or need for a product (in this case, a car.) At this stage, they may not have even settled on the need to purchase; repairing an old vehicle or doing without may still be an option. They might be casually looking at purchase options, but they are still deciding how to address their want or need. 2 - Consideration Stage: The buyer has defined their need for a vehicle purchase and is actively researching their choices. In this stage, they are considering the parameters of their purchase. What can they afford? What terms can they get with their credit rating? What models meet their criteria? They might be looking at the current lease or rebate offers from trusted manufacturers, or the highest rated vehicles on respected websites, but they are all about gathering information. 3 - Decision Stage: The buyer has decided on a solution and is ready to make their final decision. This could take different forms; the buyer might have decided on a specific model and is ready to see which dealer can give them the best price for it, or they might have decided on a general type and is ready to see what they can get the best deal on out of the various models in that type. No matter what form their decision takes, this is the customer that automotive dealers focus on. They’re ready to make a deal. While many dealers focus on the buyer that’s ready to make a deal today, engaging with buyers in the first two stages can build a rapport that pays dividends when they reach the decision stage. How can you do that? In these initial stages, the buyer is not yet ready for the hard sell, but you can still position your organization in their eye as a potential source. The average buyer has 24 research touchpoints along their journey to a new car purchase; the more of these you can capture, the better the odds are that they will choose your dealership in the third stage. One important consideration is that the majority of your customers will be using their smartphone for most or all of this research. This is a huge opportunity for the digitally savvy dealer, as optimizing your content for the mobile user will help you stand out from the pack and capture more of those touchpoints. The average person drives a car for six years, so utilize mobile apps such as Instagram, Snapchat, etc. to show pictures and video of your products; one of every twelve viewers, on average, will be in their six-month car purchase cycle. 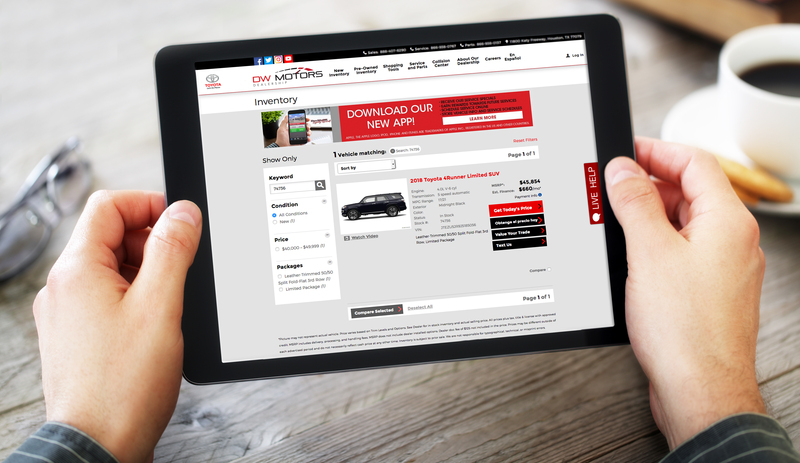 Publish articles and overviews of your cars, even general stuff like a guide to how the car buying process works. Encourage your salespeople to spend their downtime answering questions on local message boards and forums about cars and car purchases. The objective is to position yourself as a partner in their process, a trusted resource at each step of the way. Online and streaming video is the fastest-growing source of information for online car research and a great format to reach mobile device users. An engaging video can draw in buyers that might not have considered your brand or build excitement in buyers that might otherwise be ambivalent about purchasing a new vehicle. Consider taking a few of your hot sellers out to the track for a day of shooting, or have salespeople do walkthroughs of your top models. Be the window through which buyers discover their next car! Buying a car can be intimidating for many customers. It’s a big decision, and the process can seem arcane to those who are unfamiliar with it. Fortunately, by understanding the buyer’s journey and the digital toolbox your sales team has at its disposal, you can demonstrate your expertise and position yourself as their ally along the way. In combination with the excellent customer service every great dealer strives to provide, their journey can end in a business relationship with your dealership for many years and many vehicles to come!